The ComfortQuest 4x4 Hunting Blind consists of a camouflage Fabric Blind, aluminum Frame, Carry Bag and Instruction Manual. Comfortable, High Quality, Flexible, Easy to Use and Affordable! 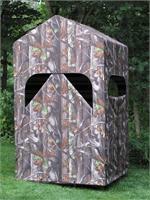 The ComfortQuest 4x4 Hunting Blind delivers them all! The ComfortQuest 4x6 Hunting Blind consists of a camouflage Fabric Blind, Aluminum Frame, Carry Bag and comprehensive Instruction Manual. Comfortable, High Quality, Flexible, Easy to Use and Affordable. Now you can enjoy your sport with others!